Local Natural History societies were instrumental in establishing Nature Saskatchewan ( Sask. Natural History Society) back in 1949. With this long standing and historically based relationship local societies form a vital role in the natural heritage community in the province. One of the ways Nature Saskatchewan works with the local societies is through the Local Societies Support Program. In 2004, its initial year, the program focused on assisting local societies by providing speakers for their regular meetings. Nature Saskatchewan also provides "start-up" support for any community who wishes to develop a local Natural History society. Contact the Nature Saskatchewan office if there is interest in your community. The Kelsey Ecological Society is named for Henry Kelsey, whose travels are commemorated on a Saskatchewan History and Folklore Society plaque on Highway 49/9, between Preeceville and Sturgis. 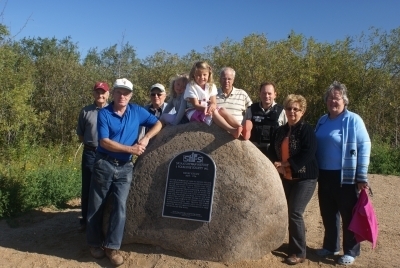 Members of the Kelsey Ecological Society unveiled the plaque on September 15, 2012 to officially commemorate Henry Kelsey’s travels through the area. The plaque is located on a large stone near the Lilian River, approximately one mile west of Sturgis. Lilian Valley corridor across the nearby Assiniboine River and up unto the open plains. that Henry Kelsey was here. The Kelsey Ecological Society was formed by a group of nature enthusiasts in April 1997, as a Chapter of Nature Saskatchewan. Our primary purposes are to bring together those who are interested in the Natural World, and to promote Education, Observation, and Sharing of Nature’s Phenomena in our area. 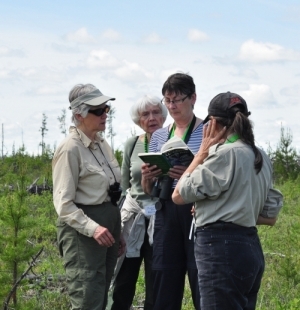 The Kelsey Ecological Society sponsors guest speakers and field tours throughout the year, and meets on the third Wednesday of each month (except December and January) at 7:00 PM. 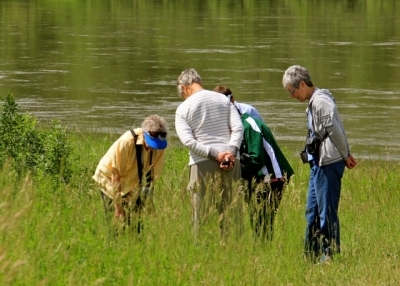 Nature Prince Albert meets at 7:30 PM on the third Tuesday of every month from September through May. Meetings held on the third Monday of each month, beginning at 7:30pm, except during the summer, and are open to the public. They are held at the Royal Saskatchewan Museum, at Albert Street and College Avenue, in Regina. Neudorf Sk, is located in east central Saskatchewan 20 minutes south west of Melville. The south end of Neudorf's Main Street runs directly to our aspen groves which contain about 15 km of walking trails. 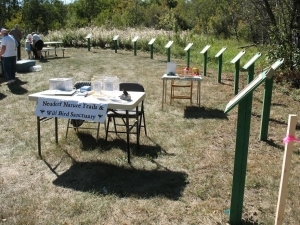 The western portion of the park is set aside as a bird sanctuary, hence the name " NEUDORF NATURE TRAILS & WILD BIRD SANCTUARY SOCIETY" We are primarily devoted to the information and education side of bird study. Our information site was opened in 2013 and consisted of a picnic area with a display of 24 plaques in a semi circle around the perimeter. Future development will be an enclosed billboard stage from which lectures can be delivered to the school children or evening sessions for all. We invite all interested persons to come to Neudorf and enjoy a walk in nature. The goal of the Saskatoon Nature Society is to promote the appreciation of nature and encourage a deeper knowledge of it through observation, education, and sharing of experience. We support nature conservation and actively advocate for the preservation of plant and animal habitats in the Saskatoon area. We conduct field trips year round, offer outdoor experiences for Young Naturalists in partnership with the Saskatoon Zoo Society, and support a weekday field trip program for retiree members; offer free monthly public lectures on a wide range of topics September through April; staff information booths at major community events; sell a guide to nature viewing sites in the Saskatoon area; maintain a web site; and host a Facebook Page. 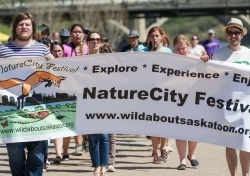 We are an active partner in a coalition to preserve and protect urban wetlands and an important natural area known as the Northeast Swale; and we participate in Wild About Saskatoon, the coalition organizing the annual NatureCity Festival. Many of our approximately 500 members (as individuals and in families) are dedicated volunteers who make these activities possible and generate a strong voice for nature in the Saskatoon area. All meetings are open to the public and usually held in the Biology Lecture Theatre (Biology 106), Geology-Biology Complex, at the University of Saskatchewan in Saskatoon. Check the website for the schedule. Meetings take place on the second Tuesday of each month, September to June; meetings start at 7:00 pm. Meetings are held at the Swift Current Museum, 44 Roberts St. W.
Wild about Saskatoon builds broadly based community support for the conservation of biodiversity by bringing awareness and issues home to the urban landscape of Saskatoon. Our goal is to foster a civic culture in which the health of Nature is central to all our public and private decisions. They work with more than 50 partner organizations to host the NatureCity Festival in the third week in May each year, offering an exciting range of outdoor experiences, workshops, speakers, citizen science projects, music, art, performance and more!